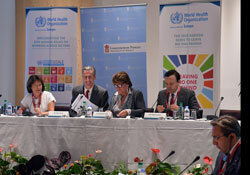 From left to right: Dr Piroska Östlin, Director of the Division of Policy and Governance for Health and Well-being at WHO/Europe; Mr Gilles Tonelli, Minister for Foreign Affairs and Cooperation, Monaco; Dr Zsuzsanna Jakab, WHO Regional Director for Europe; and Mr Stéphane Valeri, Minister of Social Affairs and Health, Monaco. Main objectives set out in the statement include joint action on reducing greenhouse gas emissions and scaling-up cooperation on climate-related emergencies. The document stresses that health effects of climate change should be tackled through close collaboration between health ministries and other sectors. The determinants of today’s biggest public health challenges, such as climate change, lie largely outside the control of the health sector and measures to promote and protect people’s health and well-being cannot be confined to that sector alone. The objectives set out in the statement are fully aligned with the Sustainable Development Goals (SDGs), which played a prominent role in the meeting agenda. Participants devoted two days to considering the best ways small countries can contribute to promoting sustainable development and health. During the meeting, the WHO Regional Office for Europe launched a new report, titled Intersectoral action for health – Experiences from small countries, to which all members of the small countries initiative contributed. The publication reveals how different countries are making organizational changes and involving various sectors to reduce disease and improve health. Additionally, it was announced that the Centre Scientifique du Monaco has been designated as the WHO Collaborating Centre for Health and the Sustainable Development Goals. A solid base of research and evidence is needed to support action on the SDGs. As a world leader on research related to sustainable development and health, the Centre’s collaboration with WHO can help make important gains in building the evidence base on the subject of health and the SDGs. The meeting in Monaco was organized by the WHO Regional Office for Europe and its Office for Investment for Health and Development, in collaboration with the Principality of Monaco, represented by the Ministry of Foreign Affairs and Cooperation, and the Ministry of Health and Social Affairs. Participating countries included Andorra, Cyprus, Iceland, Luxembourg, Malta, Monaco, Montenegro and San Marino.